Fertile, marshy ground with dark black soil and plenty of water. Dambo is the best land for farming and hunting. The timeline below shows where the term Dambo appears in The Boy Who Harnessed the Wind. The colored dots and icons indicate which themes are associated with that appearance. Mueller, Bethany. 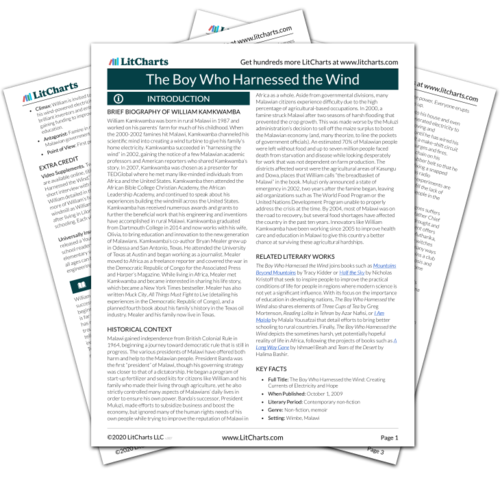 "The Boy Who Harnessed the Wind Term: Dambo." LitCharts. LitCharts LLC, 21 Jun 2017. Web. 24 Apr 2019. Mueller, Bethany. "The Boy Who Harnessed the Wind Term: Dambo." LitCharts LLC, June 21, 2017. 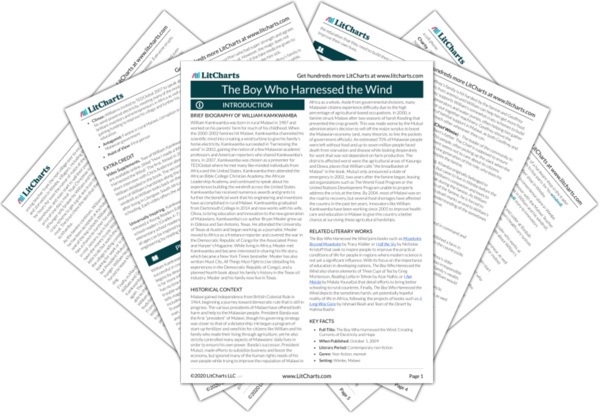 Retrieved April 24, 2019. https://www.litcharts.com/lit/the-boy-who-harnessed-the-wind/terms/dambo.